The mulberry leaf is the dried leaf of the Morus alba L. plant of the Moraceae family of plants. There are several species of mulberry bushes, including Chinese white mulberry. In China, the white mulberry bush is well known for its cultivation as a food for silkworms. In traditional Chinese medicine (TCM), the mulberry leaf is known as Sang Ye. Nowadays, blackberry species are naturalized throughout the world, including Asia, Europe, North America, and South America. As for the health benefits, the mulberry leaf can be taken dry, as tea or in extract form. In TCM, the mulberry leaf targets the meridians of the lung and liver. It contains several plant sterols that give the mulberry leaf antioxidant properties important for the prevention of diseases and health protection. The mulberry leaf contains a phytocompound called 1-Deoxynojirimycin (DNJ), which has been shown to help control blood sugar levels, an important benefit for people with type 2 diabetes. The mulberry leaf is also nutritious since It is rich in vitamins A, C and B, and minerals like iron, calcium, magnesium, and potassium. Inhibition of protein glycosylation, slow effective or prevent the development of complications of diabetes. To regulate blood sugar, evacuation of hot wind, clear lung dryness, purge toxins in the liver. Deoxynojirimycin is used for cold wind, hot lung cough, headache, dizziness, red flowers of an eye halo, etc. With health, effect is a type of mulberry leaf extract and its method of preparation and uses. The mulberry leaf contains 1-DNJ, which is a structure very similar to that of glucose. This substance was discovered because it has an effect of inhibiting the elevation of the glycaemia rate. The nutritive value of the Deoxynojirimycin depends on the variety of blackberries you consume, more relatively based on the amount of rich proteins of good quality and the mineral salts it contains. In general, sugar, starch, and polysaccharides end up being decomposed and absorbed in the small intestine of the human body. The structure is very similar to that of glucose, is linked with enzymes that break down these sugars before glucose. It is believed that Deoxynojirimycin has inhibited sugar decomposition activities, containing the absorption of sugar in the small intestine, inhibiting the sudden rise in the glycemic rate and preventing obesity. The structure of Deoxynojirimycin has the effect of improving the glycemic rate and also stimulating and accelerating the release of insulin. 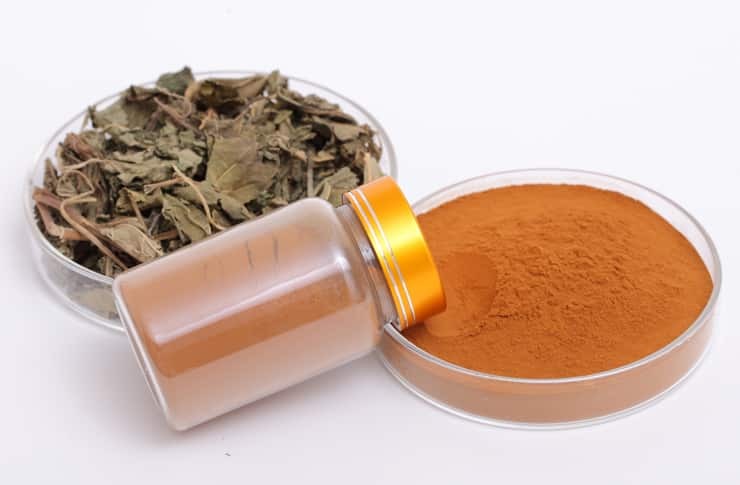 It is expected that this DNJ structure, in the future, will prevent diabetes with its flavonoids, also contained in the leaf, improving the ailments related to this sedentary lifestyle. In the studies that have been conducted in mice, the positive effect of the Deoxynojirimycin on the role of inhibiting hypertension was confirmed. It is known that the acid and aminobutyric has the effect of lowering blood pressure, and the mulberry leaf also contains Deoxynojirimycin which is believed to confer this hypotensive effect. Deoxynojirimycin improves the rate of cholesterol and fats in the blood. It has also been investigated on the prevention of arteriosclerosis by the antioxidant effect of the flavonoids contained in this sheet. Deoxynojirimycin has the effect of inhibiting the accumulation of fat and cholesterol in the liver and will improve and the functioning of the kidneys and the liver itself. The effect of Deoxynojirimycin inhibits the appearance of cancer. Deoxynojirimycin has the effect of inhibiting the proliferation of fungi, as well as the bactericidal and anti-inflammatory effect. The dry leaf of the mulberry contains a large amount of calcium. The rate of absorption of calcium contained in vegetables is not very high, but if you want mulberry leaf along with minerals such as magnesium, lactic acid, and admin or acid, absorption will be better, thus preventing osteoporosis.